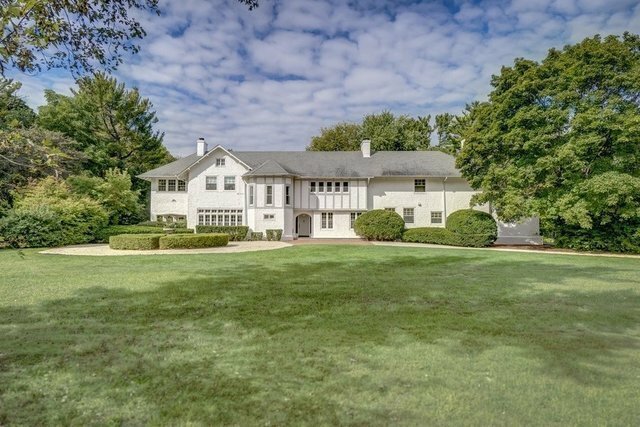 Elegant and glamorous 1907 Geneva estate on over three acres, free of any historic designations, expertly weaves French Normandy European flavor into home’s distinguished Arts & Crafts lineage. One of the town’s most exclusive properties, this imposing white stucco manor home exhibits impeccable style and irreplaceable character while offering modern day conveniences and tasteful updates. Airy, light-filled, superbly scaled living spaces show off rich quartersawn oak hardwood flooring, custom wall trims, rounded archways and 19th century treasures: a Portuguese wood apothecary and Italian marble hearth. Stunning white kitchen recently remodeled with top of the line appliances (Bertazzoni) and fixtures. This 5,400 square foot residence with a coveted address boasts a double staircase, four+ bedrooms up, charming porches, leaded extra-large windows and chic masterstrokes of high end craftsmanship. Highly desirable and walkable location just blocks to quaint downtown shops, restaurants and Metra train to Chicago.